Work to rebuild the ancient Tarr Steps bridge on Exmoor which was severely damaged during Storm Angus is now complete. Somerset County Council has been working with contractors Crestmoor to retrieve the large stones from the clapper bridge which were washed away on 19/20 November last year. Tarr Steps is a Grade I Listed structure and a Scheduled Ancient Monument made up of 17 spans and stretching nearly 50m across the River Barle. Each spanning stone is unique and teams partially dammed the river to piece the historic structure back together. Cllr David Fothergill, Somerset County Council’s Cabinet Member for Highways, said: “We look after nearly 3,000 bridges and structures but Tarr Steps is the most iconic of all. Tarr Steps has been damaged many times throughout its long history, most recently in 2013. Due to its protected status the bridge must be put together exactly as before. Additional work to clear and repair the upstream ‘tree protection boom’ to help prevent trees and debris from striking the bridge in future has already taken place. 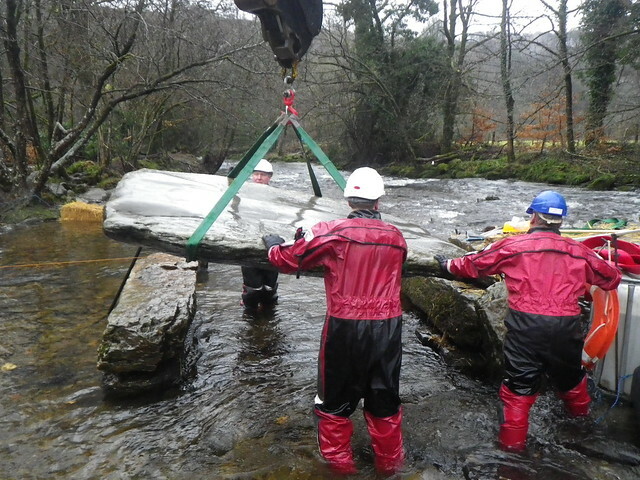 Not stacking timber along the river is also important to protect Tarr Steps and other bridges from damage. Repairs are almost complete and teams will return today to clear the site. Overall, Tarr Steps is over 50m long with 17 spans. The spans have, historically, been numbered from the west and longest stone is 2.86m long (around 9 feet 4 inches). The largest stone in the bridge is in span 7 being 2.67m long by 1.5m wide and weighing in at around 2.5 tonnes. The 16 ‘river piers’ comprise stone stacked up to support the main spanning stones at the right level. The piers also have ‘cutwaters’. These are made up of more random stones leaning upright against the piers. The cutwaters have the effect of helping holding the main stones in place, whilst also deflecting water flow and debris under or even over the bridge. The total weight of the stone in the bridge is around 50 tonnes.